Many of the best young athletes on the planet make their way each year onto the sprawling campus of IMG Academy. They train under the tutelage of some of the top instructors in the world of tennis, golf, football, baseball, basketball and lacrosse to gain a critical competitive edge. 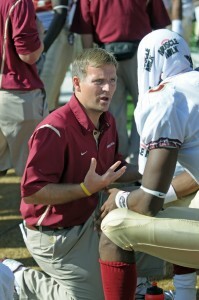 Moawad has worked with numerous collegiate athletic programs like Florida State University. But the pulse here isn’t measured only in power, speed and physical prowess. In fact, it has as much to do with mental training and discipline learning to set goals and fulfill them than all the activity flowing on the multitude of fields, courts and workout facilities. The heartbeat at IMG Academy can be found down a shaded walkway, past a weight room filled with students sweating through intense regimens and inside the doors of the renowned Performance Institute. This is the office of Trevor Moawad, the driving force in IMG’s quest to shape athletes both physically and mentally and a leading authority in the burgeoning field of sports psychology. “I had a great relationship with my dad, and I know I’m a natural extension of him in many ways,” Moawad said on a recent morning. At the same time, he is charting his own course, having helped develop and nurture IMG’s mental conditioning endeavors for the past decade. Moawad joined IMG in 1999 as an intern in the department and, after a stint as a teacher at North Broward Preparatory School in Boca Raton, returned in 2000 as a mental conditioning coach. And he’s been with IMG ever since, becoming associate director of the program in 2003, the director in 2005 with a staff of seven, and then head of the Performance Institute in 2007. In that capacity, he oversees a unit of 50-plus employees and all support services for IMG and IMG Academy â helping athletes achieve their full potential in the realms of strength, conditioning, orthopedics, sports medicine, communication, nutrition, leadership and mental toughness. As part of his broad spectrum of duties, Moawad and his staff teach IMG’s athletes to deal with the psychological rigors of their respective sports. 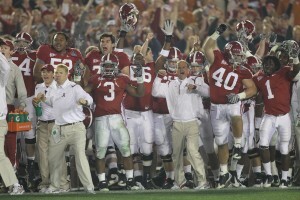 He takes the mental conditioning message to programs around the nation to work with coaches who recognize the importance and benefits of Moawad’s work head coach Nick Saban and the University of Alabama football team, Jimbo Fisher and his Florida State Seminoles, the Jacksonville Jaguars, the US Soccer Federation and many more (see accompanying list). Others, in turn, are coming to IMG to integrate mental training into their approach to the game. Case in point: The National Football League Players Association has moved its annual rookie symposium from Washington, D.C. to the IMG campus today and Wednesday, coinciding with an unofficial “mini-camp” for the Tampa Bay Bucs conducted by former FSU and Carolina Panthers quarterback Chris Weinke, head of the IMG Academy football program. “Hosting the NFL Rookie Symposium is a great opportunity for us, because we’re going to have the chance to educate a league where 60 percent of the players play three years or less,” Moawad said. “That’s valuable to me, because that tells me these guys have the aptitude to get there, but they don’t have the habits to stay there. For the most part, Moawad delegates the actual training of IMG’s students to his staff, while he and a handful of others work with college programs, athletic organizations and corporations. His goal is to spread the word on the importance of character education, a concept that includes mental conditioning, life skills and communication â reinforcing IMG’s brand in the process. Moawad developed his mental training methods at IMG with Chad Bohling, now director of optimal performance for the New York Yankees. At the core, the mental aspect is not complicated, but it is essential for athletes trying to get and maintain a competitive edge. Moawad contends most people live their lives the same way. The process of athletes talking to themselves with positive messages, and learning to integrate those messages subconsciously, is an important step in improved performance. To reinforce his positive psychological message, Moawad brings in proven performers from all spectrums of the sports world to share their insights with athletes looking to improve their game. One such figure is Olympic sprint champion Michael Johnson, a four-time gold medalist considered the greatest long sprinter ever in track and field. Moawad continues to tap Johnson for his thoughts to help others improve. In addition, he incorporates successful professionals with ties to IMG to help educate young athletes on handling pressures and challenges, such as LPGA star Paula Creamer or recently retired elite NBA referee and crew chief Bob Delaney. Delaney would train at IMG and whenever he got injured during his career, would rehab there. That’s how he met Moawad 10 years ago. Delaney recalled how Moawad utilized game situations on video as part of the process. Delaney did so for several years as head of IMG’s Officiating Academy, working with officials from the NBA, NFL and collegiate ranks. He later teamed with Moawad and IMG communications/media training expert Steve Shenbaum in staging seminars entitled “Performance Rules.”And he still fondly recalls his friendship with Bob Moawad, a regular at Seattle SuperSonics games starting in 1987. “There are many disciples of Bob Moawad who are out spreading the word, and through Trevor’s position here, the numbers just keep growing,” Delaney said. Former youth soccer phenom Freddy Adu struggled when he arrived on the world stage, but he does a better job managing the intense expectations heaped on him working with Moawad. Moawad knows about sports from a performance perspective as well. He played soccer and basketball at Occidental College in Los Angeles, earning All-SCIAC honors in 1994 and 1995. He played professional soccer briefly after graduating but an injury ended his hopes of a career. That put him on another track, education. He took a job in the Los Angeles Unified School District teaching with inner-city students, an experience he credits with vastly increasing his knowledge of performance principles. He held the job in 1996 and 1997, when a soccer pal was traded to the Major Soccer League team in Miami, the Fusion. Moawad visited the friend and decided he’d like to re-locate in Florida. Soon after, he was hired at North Broward Prep in Boca Raton, where he taught social sciences along with a sports psychology class and coached club and high school soccer and golf. That paved the way to attending a coaching clinic at what was then called the Bollettieri Sports Academy, prior to its affiliation with IMG. Moawad returned in the summer of 1999 as an intern and, after a week on the job, was offered a fulltime position at the Academy. Unfortunately, he had already signed a contract to return for a fourth year at North Broward Prep. During the school year, he also worked twice a week at the nearby Chris Evert Tennis Academy, owned by IMG. And in the summer of 2000, IMG again made him a job offer. He gladly accepted the position of mental conditioning coach â and was on his way as a leader in the field. The last eight years of his life were difficult to say the least. Bob Moawad battled a relentless and painful form of cancer of the blood plasma, multiple myeloma. But he underwent treatments and remained active on the motivational circuit until the end. After contracting Legionnaire’s Disease on a flight back from an event, due to his impaired immune system, the elder Moawad took a sudden turn for the worse and was given only days to live. The family mobilized and had some 20 people whose lives had been touched by Bob Moawad telephone him at the hospital notables such as Saban, Delaney and Washington Governor Booth Gardner among them. “He had been influential in my life, and it was a true honor to be asked to call him,” Delaney said. Meanwhile, Moawad raced from an event at the University of Michigan back home to Washington to be with his mother and older brother and at his father’s bedside. There were two options, give him sedatives that would likely lead to death within 10 hours, or put him on life support with a two percent chance his condition might stabilize. “My dad said, ‘Shoot, I haven’t spent a lot of time in Vegas, but I’ll take 2 percent over the 10 hours,’ ” Moawad remembered. Last rights were delivered and his father faded into unconsciousness, with doctors planning to give him two days to respond or remove life support. Bob Moawad lived another four months, in fact, conquering the negative prognosis with a positive outlook. One of his final appearances was in a wheelchair at a University of Washington basketball game, where people gathered around him to talk and express their affection and admiration. Trevor Moawad holds that memory â and a fundamental message of his father â close. And with many others as well, thanks to the mission that his son carries on today in the heart of IMG Academy.